Home > Events > Where Now for Catalan Independence? Where Now for Catalan Independence? Former Catalan Education Minister Clara Ponsati was due to begin a trial in Edinburgh on 30 July, but the Spanish Supreme Court has now dropped extradition charges against exiled pro-independence Catalan leaders. Despite this, nine political prisoners remain locked up in Spanish prisons on the same charges as those exiled. Those exiled are not allowed to return home. – How does the new Spanish Government change the situation? – Will the political prisoners and those exiled be freed? – What should the Catalan independence movement learn from the experience of last year’s referendum? Joanna Cherry, SNP MP for Edinburgh South West. Elisenda Paluzie, President of the Catalan National Assembly. Come along and join in the debate. Ticket cost goes towards room booking and travel expenses for Elisenda. 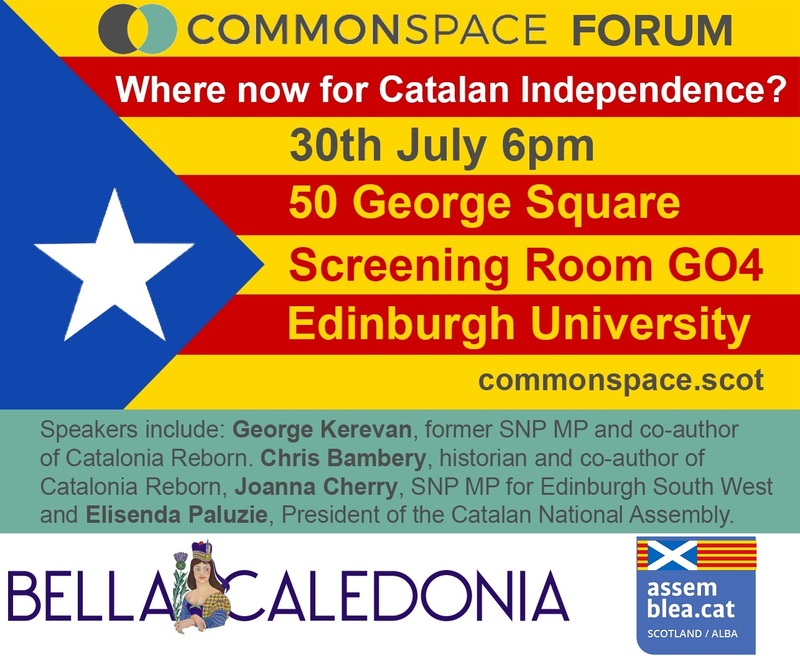 Visit CommonSpace.scot to follow our latest coverage on Catalan and Spanish politics. Sorry that is completely untrue! They choose not to return home as they prefer to evade facing the charges against them. If they are innocent what have they to fear? Probably Jamsie, because they are people in jail without trial, they are staying in prision waiting for a trial and the punishment can be 40 years in prision , how is it possible? Where is the justice? While “la manada is free”, the singers are going in jail only for their lyrics . Jasmie probably because there are people in jail without judgement, they can be condemned 40 years in jail like a terrorist. There are countless cases of innocent people being tried and convicted of crimes for political reasons. The idea that if you have done nothing wrong you have nothing to fear is Orwellian at best. States are self-serving and even democracies are inclined to act in less than ethical ways at times. The refusal of the Spanish State to allow the self-determination of a people through violence and intimidation is itself a breach of international laws, as theoretically the Spanish government is also guilty of a crime due to its handling of this matter, however, there is no organisation at the moment with the power to indict those in Spain guilty of this violation of international law. I suppose democratic mandate doesn’t really count for much eh? Bit like here where it does not exist and a fabricated grievance has to be manufactured. Fortunately even that is not working! you cannot hide your depth of wisdom Jamsie. Innocence has nothing to fear. Does that mean anyone suffering fear are not innocent? Apart from trying to have a go at me did you have a point? christ almighty………….how many people in the world do you think are languishing in prison who are innocent? it must be smugly beautiful to have such an innocent, naively fragmented heart as yours and a blinkered pea brain to match…quite a combination but I guess you are only following orders……still that excuse never held up, did it. Don’t you think people especially.elected representatives should take responsibility for their actions? Or is it ok to completely ignore the fact that a majority of the electorate did not vote for independence? The majority of our electorate didn’t vote for anything that is happening in the UK right now. Does this mean we should just cancel brexit, disband the Tories UK Government and the SNP Scottish Government and stick the whole lot of them in Jail? Or should we be sensible and only count votes of people who voted rather than assuming the opinions of people who haven’t expressed one? On your second point well where do I start? We had a referendum where we voted to stay part of the UK and voted to stay. We had a referendum on whether the U.K. should stay in the EU and the U.K. voted no. France and Spain have stated their position to wee Nicola the Scotland is not a member of the EU, that it is the U.K. who is the member and that Scotland cannot remain in the EU when the U.K. leaves. Scotland cannot meet the status to rejoin the EU and us unlikely to do so unless abject austerity is applied and even then probably would only qualify after 25 years approx. The grievance manufactured by the SNP clearly has it provided a majority in favour of either another referendum on Indy or Indy itself. So here in Scotland yes let’s listen to the people who voted and similarly in the UK we should do the same. Both referenda after all were legitimate. In Catalunya however the legitimacy was at best questionable and less than half of the electorate voted as a result of this. Why should the Spanish or the Catalans themselves even accept this? Do you see any parallels coming through? Tendentious rubbish. Claims for Catalonian independence have only ever been at about 48% in favour, and that’s at its peak and according to polls organised by pro-indy groups. Shame Spanish politicians on the whole are so second category because this would have been handled much quicker and better if the civil servants had been up to it (Rajoy’s a real dreg). ‘polotical prisoners’. LOL! Get a grip on reality guys. Nobody takes this bid seriously. I’m Spanish. I’ve got a question. Will be free in the UK break the rules? It really doesn’t exist political prisioner in Spain. They are people who tried to break the pacifical convivence among catalonian and citizens from the rest of Spain. Give it a rest. These people are traitors, you should not mix with them. Asked dear little Clara Ponsati lately how her latest scam is going? She is asking for money on gofundme when she has hundreds of thousands of euros stashed away in Spanish banks.